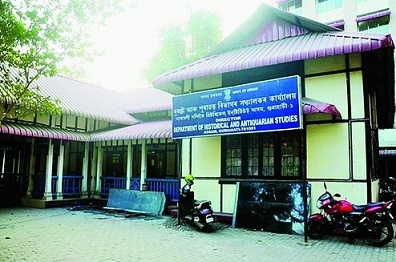 In a major decision, the Assam Government has decided to merge the Directorate of Historical and Antiquarian Studies with the Directorate of Museum. The decision has been taken to bring in semblance with the mandate of both the directorates so that the works of preservation, display, research, and communication for the purpose of study, education and enjoyment of the cultural objects of this state can simulated and brought under single umbrella. Holding a meeting with the Department of Higher Education at the conference room of his office in Janata Bhawan on Monday, Assam Chief Minister Sarbananda Sonowal asked State Education Minister to hold parleys with the Department of Culture and draw a blue-print and fix modalities to take the merger to its logical conclusion. Sonowal maintained that the merger would help to direct both the directorates to a systematic and comprehensive method of research and collection of rare and old manuscripts along with others. The meeting also decided to take the office of the Chief Minister and Education Minister close to the college teachers and as a part of it, Chief Minister Sonowal and Education Minister Siddhartha Bhattacharya will hold interactive meeting with 10,000 college teachers across the State. The interactive sessions have been aimed at taking into cognizance the issues of the college teachers and enable them to render their duties and bring in more improvement in the overall landscape of education in the state. The interaction of the Chief Minister and Education Minister with the college teachers will also strive to using the services of the teachers to stimulate skill development of the students. Moreover, in another decision expected to have a far-reaching impact, State Government will provide bi-cycles to all the girl students for securing first division in HSLC Examinations. As a part of the decision all the girl students will get bi-cycles for securing first division from the year 2018 onwards. Sonowal while reviewing the progress of the work of 10 Government law colleges in the State, asked the Education Minister to expedite the work so that academic activities of the colleges start very soon. To bring in more professionalism in the administration of academic activities in B.Ed colleges in the State, Chief Minister Sonowal said that all B.Ed colleges to be brought under the administrative control of Higher Education Department instead of Elementary Education. Moreover, considering the high demand among the students for B.Ed degrees, the course would be introduced some in some select provincial colleges in the State. During the course of the meeting, it has also been informed that academic activities of the under-construction Golaghat Engineering College will start from August this year and students will be enrolled accordingly. Moreover, to stimulate the employability of the engineering and commerce graduates, 10 centres of excellence will be set up where industry bodies will be imparting training to the students as a part of Entrepreneurial Resource Programme. Another decision which deserves mention is the decision of allocating one dedicated government lawyer to each Police station to help the police personnel to register cases and draft the case diary in accordance with the spirit of law. Chief Minister’s media and legal advisors Hrishikesh Goswami and Santanu Bharali, Principal Secretary to Hgiher Education Ajay Sankar Tiwari, Principal Secretary to the Chief Minister Sanjay Lohiya and few other senior Government officers were present at the meeting.